Dynamite distributor Joan R. has a special perspective when giving a product testimonial. As an animal communicator, she travels around the nation teaching pet owners how to connect and communicate with their animals. Joan shared with us the story of how her dog Olivia helped her to understand how much she really enjoyed her Canine TNT. I travel a lot to teach animal communication. Early September 2012, I started my dogs on the Dynamite Canine TNT. I have always loved Showdown (the dog vitamin). The smell alone makes the morning right, along with coffee, of course. I’ve also been a big fan of the horse TNT – a combination of my favorite vitamin, minerals, joint supplement and more. I have been hoping one day for the human and then the cat TNT – hopefully, those are future product reviews! 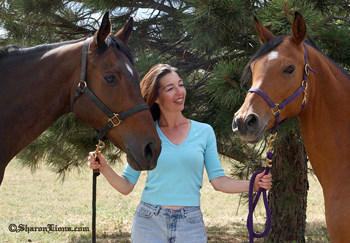 The last weekend of September, as usual, I am in Denver, teaching Animal Communication. On day 2, I hand out the picture of my dog Olivia for the class to connect with her remotely. It is an intimate group of about 15 and Olivia is an excellent teacher for day 2. For my students, Olivia’s picture builds confidence as she always gives the same type of message to each individual. When it came time for feedback from the animal communication session, every person was saying: “Olivia says her coat is soft.” Something along these lines was mentioned by all members of the class. “Olivia says her coat is beautiful.” I have to be honest…..it is nice. Isabella, my black lab, has a super shiny, noticeable coat. Always has. I didn’t want to tell my students that Isabella had a nicer coat, because, who am I to deny Olivia the right to feel as if she has a beautiful coat?! Right? I leave Denver to work in North Carolina the first week of October. That following weekend, I have a Beginner-Advanced Animal Communication workshop. Again, Olivia is telling the whole class how great her coat is. I think, Joan, take a deep breath…..is this the beginning of adult onset dog dementia? She was only 10 at that time. It’s possible. When I get back to my farm, after 2 weeks on the road, I kneel down to love on Olivia. I am blown away at how soft her coat is. She has always had a nice coat, don’t get me wrong. It’s just that Isabella has always had a stunning coat, so I didn’t want to compare in any way, shape or form. Yet, there she was, her coat so soft. And even more important to our adventurous lifestyle, her (then) 10 year old body is also so spry. Olivia is now 11. I do rotate Omega 3’s, Turmeric and MSM on top of the Dynamite Canine TNT – we go on 3 mile dog hikes 4 days a week….once a week with a large pack of dogs. She runs around this farm like she was 4. I keep up on body work by other practitioners and add in my own acupressure several mornings. The one consistent, everyday thing that keeps her super active and her coat so soft is the dynamite Canine TNT! The Canine TNT will improve anything – if you are feeding raw or if you cook for your animals. If you feed kibble or wet food – this is the ticket to making whatever you are doing even way, way better. We have a very active life! We have lots of friends! A girl’s got to keep up with the rest of the pack, if not run it! For more information about Joan and her work as an animal communicator, visit: joanranquet.com. If you have a Dynamite Story you’d like to share, please send it to us here. *The statements made on this page were given freely and are the sole opinions of the author. We always caution that one person’s experience is not a guarantee of results. The statements have not been evaluated by the FDA and are not intended to diagnose, treat, cure, prevent or mitigate any disease. Dynamite Specialty Products takes a firm stance that our products always be used in accordance with the opinions and expertise of your trusted health care professional, doctor and/or veterinarian. TNT – Product Spotlight for October! Super Premium Dog Food and TNT to the Rescue!